I was standing in front of fish monger when I thought about this simple recipe, well and the result was very nice. 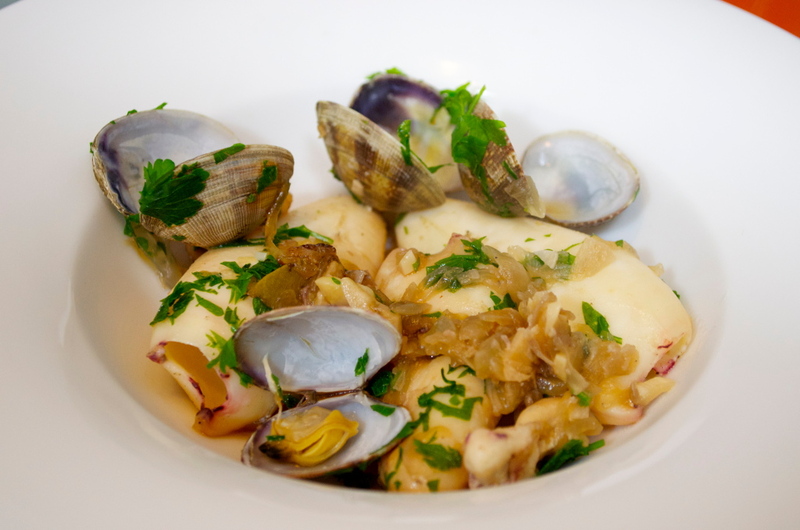 Those clams at the end give to the dish a superb flavor and it’s pretty easy to cook. Let’s start chopping just one onion if we found little squid or two if we bought regular ones. Chop 4 garlic cloves. Chop a bunch of parsley. Put some olive oil on a pot and then add the onion and garlic, the squids, salt and ground pepper, about 3 bay leaves and a bit of white wine. Mix well before covering the pot with a lid and cook about half hour until all the liquids evaporate. Uncover the pot, mix well and add about 10 clams and the chopped parsley, cover again the pot and maintain the fire for one minute and half, and then let rest about 3 minutes before uncovering the pot and serving. Music played in the video (Airport Lounge) was composed by Kevin MacLeod (http://incompetech.com), also he is the owner of song’s rights which are released under a CC-BY.